It’s early days for the Southern Michigan Railroad Society (SMRS). Our first piece of rolling stock was a Fairmont M19 motor car, #M-76, donated by Thelma Miller of Dundee, Michigan. Her late husband had worked for the Ann Arbor Railroad, and had the ex-AA speeder in a barn. The car was painted and returned to service by the blog’s author and is seen here on one of its first test runs on a hot day in July 1994. The car is running southbound at Tecumseh Junction, piloted by the blog author (decked out in Conrail blue!) and having just crossed the DT&M diamond. 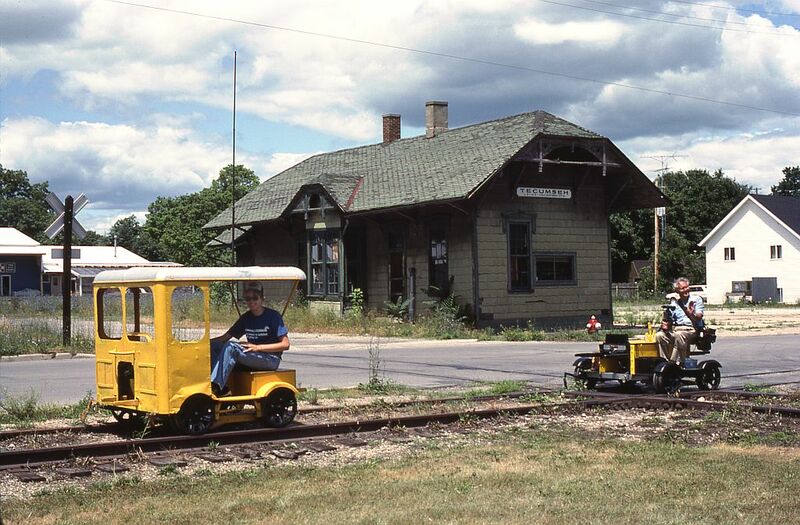 On the right is an ex-NYC M9 motor car belonging to Doug Leffler of Jackson, MI and carrying Hudson, MI rail historian, the late Jim Findlay. In the background stands the forlorn-looking Tecumseh Junction depot, which would soon be moved from this spot. Thanks to Doug Leffler for sharing this early SMRS view.